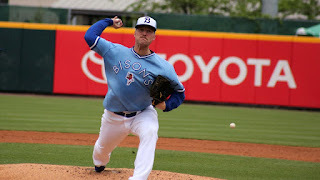 BUFFALO, N.Y. -- On a scorching hot day in Syracuse, the Bisons received a quality start from Sean Reid-Foley as the Herd avoided a sweep and took home a 4-1 win Sunday afternoon. Reid-Foley was excellent, tossing six innings of two-hit baseball while striking out five batters and holding the Chiefs scoreless. An early pitcher's duel ensued between Chiefs starter Austin Voth and Bisons starter Reid-Foley. After the first four innings of play, neither team was able to score and had just three combined hits. Reid-Foley faced the minimum the first time through the Syracuse batting order. For the third game in a row, the Bisons got on the board first. 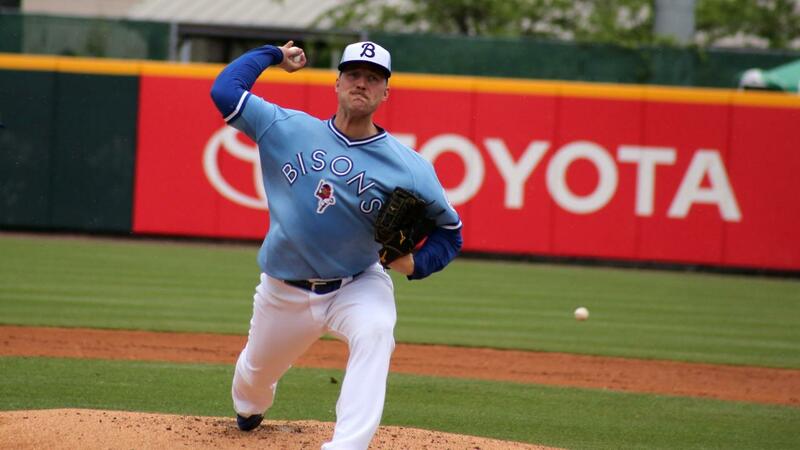 It took them until the fifth inning, but Buffalo broke the scoreless tie. Michael De La Cruz pulled a double into the right-field corner to score Jason Leblebijian, who ran all the way home from first base after drawing a walk. The Chiefs threatened to even the score in the seventh, but Herd reliever Jose Fernandezinduced two groundball outs to strand Jose Marmelejos at second base after he delivered a one-out double. The Bisons got much-needed insurance in the eighth in a similar fashion to their first run of the game. Lourdes Gurriel Jr. slashed an opposite-field double to plate Richard Urena from first base after he drew a lead-off walk. Gurriel Jr. advanced to third on a groundout to the right side by Rowdy Tellez and scored on an RBI-single from Dwight Smith Jr. This moved the score to 3-0. In the ninth, Gurriel Jr. helped the Bisons tack on another run after the inning was kept alive on a fielding error. He collected his third hit of the game, an RBI-single, to bring home newcomer Andrew Guillotte. The only run scored by Syracuse came in the eighth on a solo home run from Chris Dominguezand the Chiefs were held to four hits by the Bisons pitching staff. Rhiner Cruz registered his first save of the season as he closed out the game in the ninth. He got some help from the defense, including a double play initiated by Urena, to set down the Chiefs and seal the victory.